Both heart attacks and strokes are life and death situations that can cause hospitalization or even death. However, some people confuse the meanings of the terms. Though heart attacks and strokes may arise from the same lifestyle factors, there are fundamental differences between them. 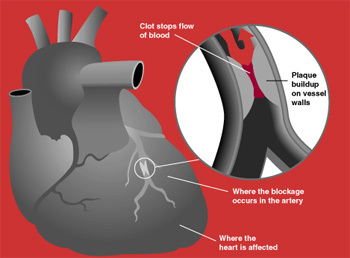 A Heart Attack occurs when blood supply is cut off to a portion of the heart muscles. This may happen due to a clot in one of the arteries that supply the heart with blood. WhenÂ blood flow to the heart is obstructed the symptoms of the heart attack are felt by the patient. These may include chest pain, breathlessness etc. Most heart attacks are not the sort you will find in movies. Most start off with a mild pain and tightness in the chest. In fact, the symptoms may be so negligible that a person might be tempted to ignore them altogether. If you feel a discomfort in the middle of the chest, breathlessness or a feeling of being squeezed, get a doctor immediately. While it is possible that your symptoms may not be those of a heart attack, you do not want to lose time in case they are. You should also be careful if you feel dizzy, experience discomfort around your jaws, arms or shoulders. Other symptoms of a heart attack may include breaking out in a cold sweat, lightheadedness or nausea. A sudden weakness or numbness in the face arms or legs, particularly those concentrated on a specific side of the body. Sudden confusion or a difficulty to understand or speak. A sudden and severe headache without a known reason. Though the conditions are different, they may share common lifestyle factors which cause them in the first place .If you are overweight, a smoker or lack adequate exercise, suffer from high blood pressure and stress, you are more prone to having these life threatening conditions. In both these cases, it is very important for you to get medical attention as fast as possible. How fast you get aid will determine the extent of the damage and your chances of recovery. Read more about Heart Attack and Stroke. Purpa Mukherjee. "Difference Between Heart Attack and Stroke." DifferenceBetween.net. August 27, 2009 < http://www.differencebetween.net/science/health/difference-between-heart-attack-and-stroke/ >. My sister in law suffer an stroke and now she is in an itensive care I myself have an heart attack in year 200 at 3.45 am I arrived in hospital at 10.00 am after all the test my doctor discove it is a blockade that knock me down would you please explain more clearly betwen stroke and heart attack.